Call home for as low as 2 cents per minute when calling back to the USA. 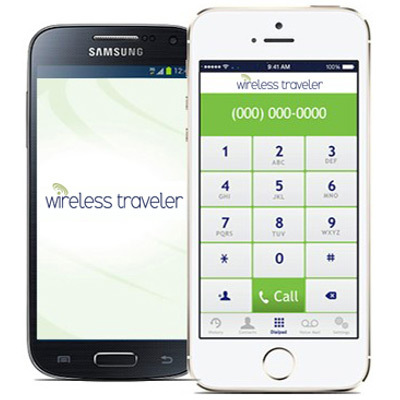 Download the Wireless Traveler WiFi Calling app for free from iTunes or Google Play Stores. Just search for Wireless Traveler. If your friends and family download the app call app to app for FREE. Add some prepaid airtime now and just $5 gives you up to 4 hours of calling and is valid for up to 12 months. Crystal clear calls whenever you are in Wifi at your hotel, the airport or using a pocket Wifi. Even from your home Wifi you can call all over the world for pennies with the Wireless Traveler Wifi calling app. The person you are calling does NOT need to be on the app. You can call to ANY landline or cell phone. And it comes with a US telephone number number so you can let everyone know in advance that it is YOU calling. Plus you can be called back on your US App number while traveling abroad. Set up and personalize your voicemail before your trip! Be sure to swipe out of the Wireless Traveler WiFi Calling app when you are finished calling, so as not to drain your battery.